The Corrective and Preventive Actions (CAPA) module is used to record and track measures taken to correct and/or prevent quality failures. Create a Corrective Action report and document the reason, investigation, containment, root cause, corrective action, verification, prevention and approval. Corrective Action Reports help you satisfy international quality specification requirements to identify, correct and, where practicable, prevent adverse quality conditions. The CAPA module can be a tool for reporting the results of corrective and preventive efforts to management. Designed specifically to meet all the requirements of a fully functional corrective action system as described by quality standards such as ISO 9001, ISO 13485, AS9100, TS 16949 and SQF 2000 / ISO 22000. Conforms to the classical “8D” corrective action format. Process Corrective Actions – designed to capture corrective/preventive information related to products, parts or processes. They are intended for the tracking of internal product failures. Vendor Corrective Actions – designed to capture corrective/preventive information related to vendor supplied component parts, sub-assemblies, or services. They are intended for the tracking of supplier-related failures and can be a tool for communication with your supplier. Audit Corrective Actions – designed to document corrective/preventive information related to audits conducted internally, by customers or by third parties (i.e. ISO compliance audit findings). They are intended to document and manage audit findings. Link corrective actions to nonconformances. 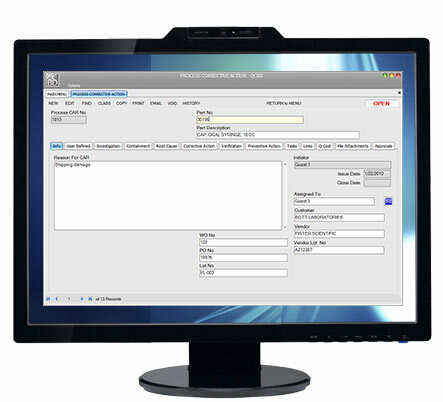 View vendor-related corrective actions through the Supplier Management module. Link training records (in the QCBD Training Management module) to specific corrective actions. Use the QCBD Report screen to build custom queries of your corrective action data. ‘Slice and dice’ the data in ways that are meaningful to you. Analyze corrective actions broken down by category, frequency and type. When it’s time for management review (or during an audit), report your corrective actions with the click of a mouse.